This entry was posted in Uncategorized on November 5, 2014 by renounceuscitizenship. The lives of United States Citizens and Lawful Permanent Residents living outside the U.S. has necessarily become more complicated due to FATCA. Previous posts discussed unintended consequences of FATCA. 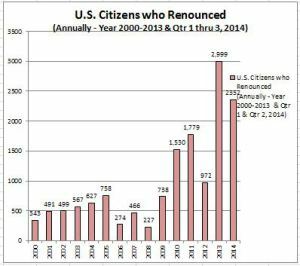 See, Part 2 – Unintended Consequences of FATCA – for USCs and LPRs Living Outside the U.S.
Also, see, Part 1- Unintended Consequences of FATCA – for USCs and LPRs Living Outside the U.S.
– One of the most significant unintended consequence, is that the U.S. federal government (the IRS, the Treasury Department, or Congress) never initially even contemplated USCs and LPRs living overseas. In other words, the group targeted were U.S. resident individuals who were evading taxes through foreign financial institutions. I say this, based upon extensive conversations I have had with ex-government officials and some government officials who were involved in the original policy discussions. This entry was posted in Uncategorized on November 3, 2014 by renounceuscitizenship. Really, it’s time for the United States to stop taxing citizens who live outside the United States and the profits of corporations that are earned outside the United States. Territorial taxation for both. Republican victories in Tuesday’s U.S. midterm elections are unlikely to rattle equity markets, but could lead to significant changes in corporate tax policy and mark the beginning of the end for popular tax inversion deals that saw Burger King Worldwide Inc.’s proposed merger with Tim Hortons Inc.
S&P 500 companies earn 40% of their profits abroad, up from 15% in the mid-1990s. As a result, most large U.S. multinationals are exasperated by high U.S. corporate tax rates and more so by the taxes imposed on foreign profits when repatriated. Note the two ways that a Green Card holder can terminate tax residency status. File the I-407 and through a Treaty Election. See Will Qtr 2 Exceed Qtr 1 – 2014, Record of USC Renunciations? As has been mentioned previously, this list does not include lawful permanent residents who have terminated their LPR status for purposes of these tax law provisions. 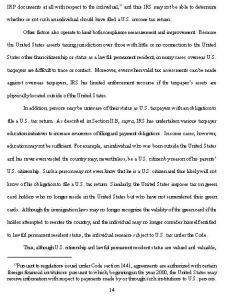 For further reading on LPRs, see, Countries with U.S. Income Tax Treaties & Lawful Permanent Residents (“Oops – Did I Expatriate”?). This entry was posted in Uncategorized on November 2, 2014 by renounceuscitizenship.